You might have noticed something different when ordering a drink in a bar or restaurant recently. Many companies now use paper straws in their drinks. Some have done away with straws altogether. Others keep plastic straws behind the counter, only available on request. It might not sound like a huge deal – but it’s a sign of the significant change in the attitude the public, the government and major corporations have towards plastic. And, as Prime Minister Theresa May has acknowledged, that change is largely thanks to Blue Planet II – the nature series fronted by Sir David Attenborough, broadcast last winter. 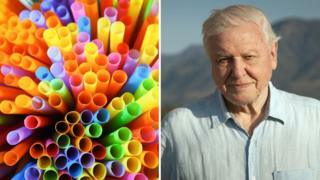 The last (plastic) straw: Who’s banning them? But, the presenter tells BBC News, influencing government policy isn’t his top priority when making such series. “We all have responsibilities as citizens, but our primary job is to make a series of programmes which are gripping, truthful, and speak about something quite important,” he says. Hot on the heels of Planet Earth II and Blue Planet II comes this year’s Attenborough-fronted programme: Dynasties. The five episodes of this series, which begins on Sunday, are broken down into chimpanzees, lions, penguins, tigers and wolves. After Planet Earth II’s snakes and iguanas chase won a TV Bafta for must see moment, is there a similarly breathtaking sequence in Dynasties? “Not one, there are several, there are truly several,” Sir David says. “There’s certainly one in the opening programme, which is when an old chimp is beaten up. Dynasties may not have quite the same overt political message as Blue Planet II, but there was one issue which kept recurring, says executive producer Michael Gunton. “This series is about the problem, for a lot of these creatures, that there just isn’t enough space for them to survive,” he explains. Gunton singles out tigers as a prime example. He says a successful breed of tigers in a reserve means a “pressure cooker” is created by their increasing population. “They’re very good breeders, good at looking after their young… it’s just they don’t have the space,” he explains. That particular episode sees one tiger in India take the risky decision to leave her reserve to hunt for food, as rival tigers, seeking their own territory, are encroaching on her hunting lands. It’s not long before people spot her and call the forest department, who tranquilise her and eventually return her to the reserve. One issue that has repeatedly cropped up with nature documentaries in recent years is whether filmmakers should interfere with what they see while shooting. But witnessing animals in distress can be difficult for crews, who have been known to occasionally intervene. In 2016’s Planet Earth II, the BBC confirmed producers had stepped in to rescue some stranded baby turtles. The episode of Dynasties focusing on emperor penguins threw up a similar dilemma. A number of females are seen getting blown into a gully in a storm, unable to to get out because of the steep walls of snow and ice they are surrounded by. “They have this terrible problem that they can’t move very well when they’ve got the chicks on their feet, because if the chicks fall to the ground and when they’re that age they’ll die,” Gunton says. “And there was this very steep side, and they couldn’t climb out because they couldn’t move their feet effectively enough. So some of them had to make a horrible decision, which was to save themselves and abandon their chicks. The camera crew then took a break from filming as another storm moved in, but they returned to the gully soon after. “It was clear that unless [the other penguins] had the wit to do that, which most of them didn’t seem to have, they were all going to die,” Gunton continues. That is precisely what the team ended up doing. They created little notches in the slope, effectively creating some steps for the penguins to find their own way up and out. “Weirdly, if people knew we’d had the opportunity to do that and we hadn’t, that would’ve been a much more difficult thing to answer,” Gunton says. Perhaps one of the most intriguing aspects of the nature documentaries Sir David fronts is their huge popularity with young audiences. He acknowledges that escapism might be a key part of the appeal of such series. Regardless of what side of the political divide you’re on, often, you just want to switch off. “I think all of us faced with what we are faced with, Brexit, every time you turn on the television set, you get it,” he says. “I certainly watch the news all the time, and to get a programme about something which is more fundamental and more elemental, and also absolutely true, I wouldn’t say it’s an escape, because it’s reality, but it’s a great change and a great relief. Dynasties begins on Sunday 11 November on BBC One at 20:30 GMT.